But it never quite does. 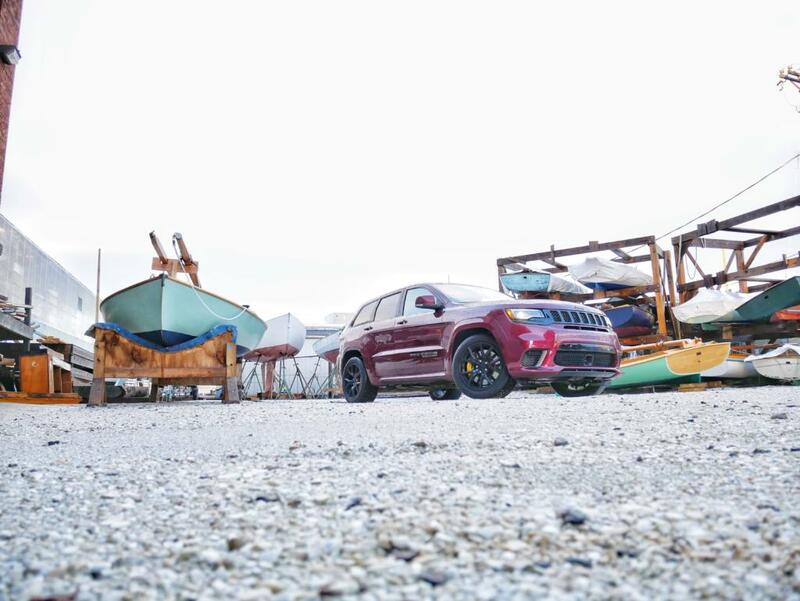 The Made in Detroit Jeep Trackhawk maintains its outwardly calm cover at all times. This, even as its driver (yours truly) understands the charade, understands the depths of depravity the Jeep is capable of channeling. Dreams of rampaging up and down the eastern seaboard, utilizing each and every one of the supercharged Hemi’s 707 horsepowers, dance in my head while I instead play along with the side of the AWD SUV that identifies as a luxury vehicle with seating for 5. Every stop sign, every stoplight, every entrance ramp I was there acting like a FBI profiler poking and prodding Hannibal Lecter. Accelerate a bit more here, brake a smidge later there, in between maybe pass a car in a limited window. What was it capable of? What would it show me? How far was I willing to push it? I wanted to know what the Red Dragon knew, without getting killed, cooked, and served with a side of fava beans. Plus I had a full house: myself, my wife, and my brothers. On our pleasant trek east towards Plymouth Rock there wasn’t much time to fool around. We had a schedule to keep up with and the weather was iffy. 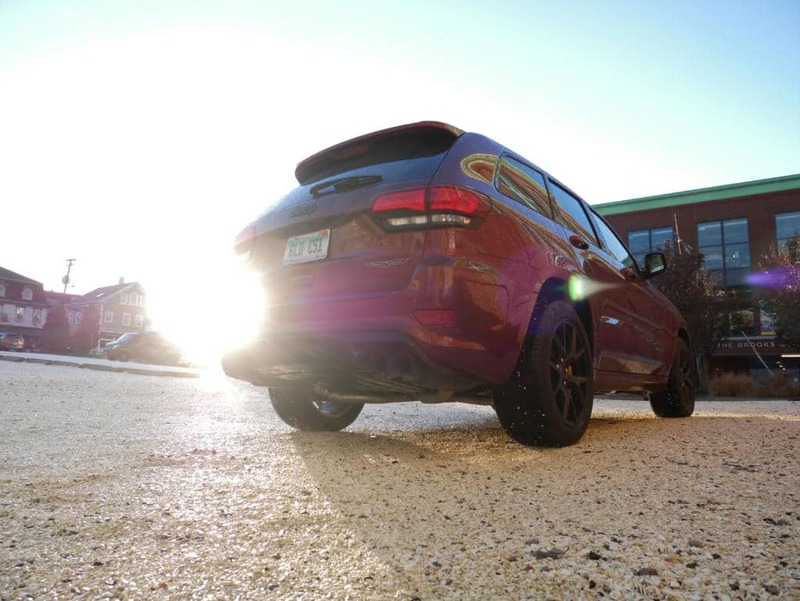 For all intent and purpose the Trackhawk was a very comfortable cruiser, taking in the 5 occupants and our luggage, eating up interstates, no problem. 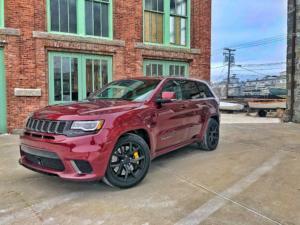 To me that’s the biggest difference between Jeep’s take on a Hellcat-powered Grand Cherokee and what Dodge did with the 4 door, 707hp Charger Hellcat. They might have the same strong heart but their souls diverge from there, and that’s not by accident. Jeep, Dodge, and SRT have worked to create personality traits distinct to each brand. The Charger Hellcat is fully “Jesus Christ Pose” Soundgarden, and you’ll pick up Chris Cornell’s (RIP) glorious screaming long before you can see the car. 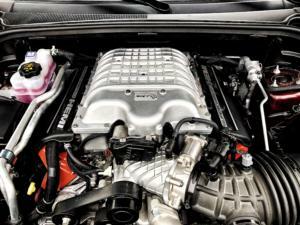 The throaty V8 exhaust mixed with a screaming supercharger make for an obscenely addictive noise, to the point where you want to keep mashing the gas just to hear it sing. Put it in drive and give the car any amount of throttle and a bacchanalia of smoke and rubber and burnt fuel ensues, announcing to the world it’s arrived and ready to party like a rock star. It’s the Global Burnout Machine World Champ*, stock production class, 3 years running (The Challenger Redeye should take the crown in 2019). The thing about psychopaths is that to the average observer, they appear charming, intelligent, and confident. Enter the Jeep. The Trackhawk maintains a calm presence and relishes in keeping it’s less “socially acceptable” tendencies on the down low. The killer instinct is always lurking, but in the shadows, concealed from the masses by an affluent interior, sleek facade, and, at least relatively speaking, a muted exhaust/engine sound. The Trackhawk is smooth, sophisticated, and sipping on a tumbler of straight J&B as it plots the next foray into madness while the Charger is shotgunning beers on the infield of Daytona. 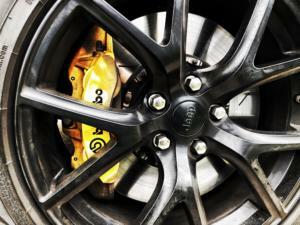 Having traction is another little trick the all-wheel drive this SRT has up its sleeve that the Hellcat does not. Stoplight to stoplight it would already be idling at the next red while the Dodge was still putting on a smoke show Cheech and Chong would be proud of. The Trackhawk’s instant hook from a dig, whether the conditions were warm or cold, dry or wet, snow or rain, was the thing that made me ponder if it’s maybe my favorite thing I’ve driven. All that is not to say it can’t get sideways. A hotel parking lot in New York offered us chilly temps and a fresh coat of snow. While my siblings were checking out and grabbing coffee I went outside to “warm the Jeep up” AKA put it in Track mode and drift figure 8s around light poles. With a 30/70 split and traction control off I had zero issues gliding it sideways around and around before pulling up under the canopy to load in the family. 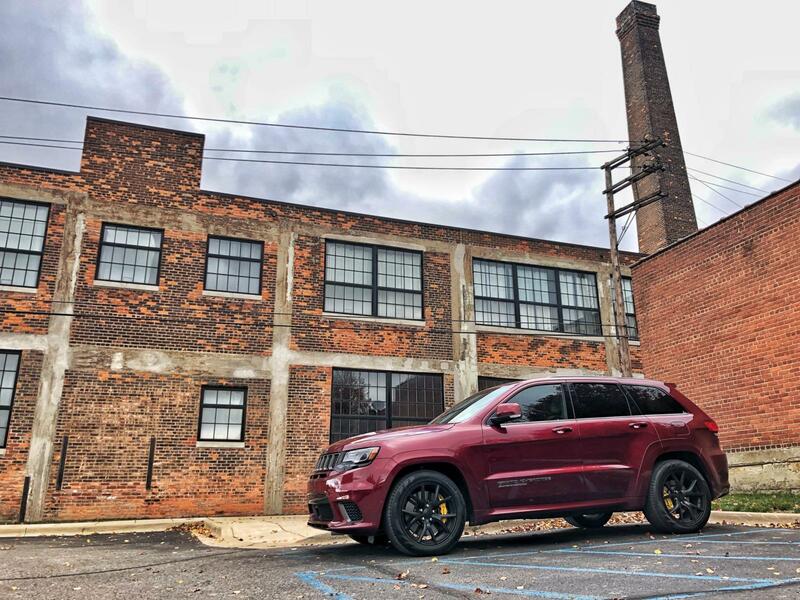 While it is pretty slick, if the Trackhawk was sitting in a conference room around a table comparing business cards, restaurant reservations, and junk size with the Alfa Romeo Stelvio, a Porsche Cayenne Turbo S, an AMG GLS63, and, say, a BMW X5 M, things could get a little tense. The Jeep is Bateman again, a bit of a loner trying to one up its co-workers, an “elite” group of yuppies, maybe feeling a little under appreciated. Then the X5 M gets into Dorsia? Grab the axe and put on a rain jacket. Here’s a little unsolicited advice to the BMW: if you see the Trackhawk and hear Huey Lewis and the News pumping out of the 19 speaker Harmon Kardon sound system, run. And hide. *This doesn’t actually exist anywhere outside of my head.